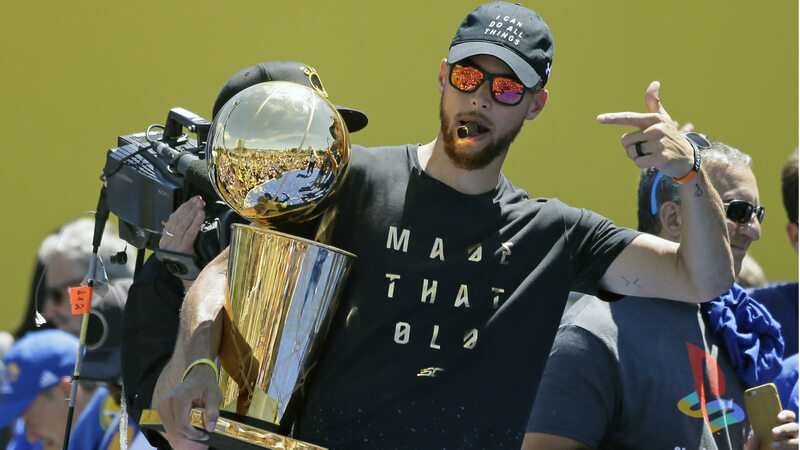 OAKLAND, Calif. (KGO) -- The Golden State Warriors will host a Championship Trophy Tour at all Warriors team stores throughout the Bay Area this week, where fans will get an opportunity to take photos with the 2017 Larry O'Brien NBA Championship Trophy. Hey, #DubNation! Who wants a 📷 with Larry? The Warriors captured their fifth NBA championship earlier this month as they defeated the Cleveland Cavaliers in the NBA Finals 4-1 and set an NBA playoff record going 16-1 throughout the 2017 NBA Playoffs. Thursday, June 29 - Dunk Contest in Burlingame located at 275 Primrose Road from 11:00 a.m. - 3:00 p.m.
Thursday, June 29 - Dunk Contest in San Mateo located at 60 E 31st Ave from 4:00 p.m. - 9:00 p.m.
Friday, June 30 - Warriors Team Store at Oracle Arena located at 7000 Coliseum Way in Oakland from 10:00 a.m. - 5:00 p.m.
Saturday, July 1 - Warriors Team Store in Walnut Creek located at 1201 S. Main Street from 10:00 a.m. - 6:00 p.m.
Sunday, July 2 - Warriors Team Store at the Westfield San Francisco Centre located at 865 Market Street, Suite 249 from 11:00 a.m. - 7:00 p.m.